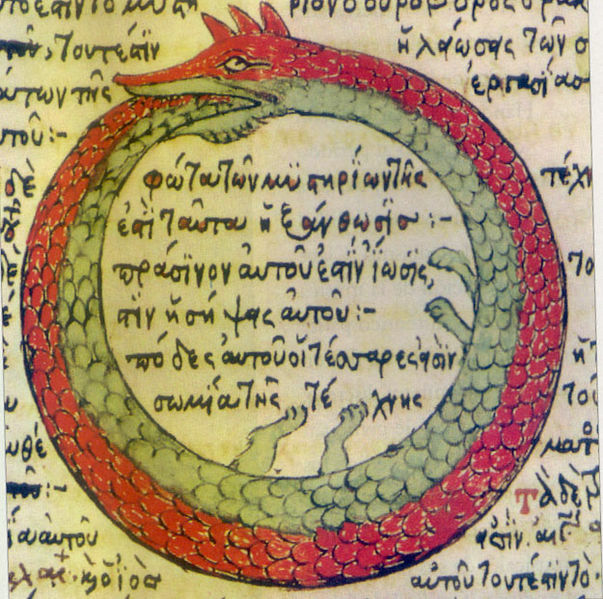 An ancient symbol depicting a serpent or dragon eating its own tail. Wikipedia Commons public domain image. About two years ago, someone nominated me for an award. I have to admit that, although I had been blogging for a while, I didn’t understand the whole award thing. I wasn’t aware that you could declare your blog to be “award free” or that I could set up an Awards page or that I could accept the awards and have a relatively easy post to write. I didn’t know how often I would be looking for an easy post to write. I’m not sure that I understand awards yet but I understand that the math of awards is self-defeating. Ultimately, a typical WordPress award would turn into an Ouroboros since people would have to start re-nominating previous recipients. I really appreciate the award. I am responding (sorta) but not officially. Not according to the rules. I’m not good with rules. I don’t want to tag 10-15 of my fellow bloggers, but not for the reason you might think. At least two of the awards that I was nominated for were for the fact that I inspired someone. Wow. It’s going to take a while, or perhaps a Patriots quarterback to deflate my ego after reading that…twice. I love thinking that something I’ve written could inspire someone to do something. The problem I have is picking a small group of you to designate as inspiring me. You all inspire me! I’m not going to list the names or provide the links, you all know who you are, but I am inspired each time I read new posts, comments, replies to comments and comments on other people’s blogs. You people are amazing! I am inspired by the poets that I follow. I have a poetry post (not a poem) in my drafts folder, but I keep having to revise it as I follow more poets and as the poets that I follow stretch themselves to new heights (or lengths for those horizontal poets). I am inspired by the photographers that I follow. I love photography. I include a lot of pictures in my writing and I know how hard it is to get really good photos. Some of the photographers I follow take some amazing pictures. I am inspired by the authors that I follow. Those of you that have written books, are working on books or working on your next book – you make me shake my head in wonder. I don’t know how you do it. I have trouble containing these posts to 1,000 or fewer words, but the thought of writing 40,000, 50,000, 70,000 words that look like they all belong together – that makes my head hurt. I am inspired by the bloggers that I follow. As I read the stuff that lands in my inbox each week, my thoughts vacillate between “I can’t believe how well people write” and “I see what at you did there, that is so cool.” I am inspired by people who speak with a voice that is spontaneous or humorous or nurturing or helpful or self-deprecating or curious or, well, you get the picture. By the way, the people who will soon pump out 26 alphabetically inspired posts in a single month – Oh My! You people are nuts truly boggle my mind. I am inspired by the inspirational blogs I follow. The people who write about God, religious topics, spiritual topics and the topics that are greater than us and that inspire me to become a better person. I am inspired by the techniques that I see, the hooks that are used, the catch phrases, interesting titles and the literary devices that make these short bits of prose jump off the page. I am particularly inspired by the people who share information as to how to incorporate these techniques into my blog, my writing and my communication. Lastly, well, not really but I’m going for an effect here, hang on. Lastly, I am inspired by the people in other countries (including Canada) who are helping me to better understand this planet that we live on. I follow people from almost every continent (Antarctica needs more bloggers). I’ve learned about more religions, customs, holidays, baked goods, laws, wars and lifestyles than I ever imagined existed. Since a common task among the awards I was nominated for was to reveal seven things about myself, I think I complied (see, I told you I was going for an effect). If I can inspire you to do anything today, I would ask that you check out the latest post by the three people who nominated me for an award. If you do that, I’ll feel better about accepting an award that I couldn’t handle. Christine Robinson – You can explore the many facets of Christine’s blog but I am always inspired by her sunset photos. Sharukh Bamboat – Sharukh writes about India, travel in India and lately a lot of other things/ Sharukh has a few blogs, but I am linking you to his newest and I think his most personal one. Oh to Go a Wandering – Rebecca says that she’s a girl with a passion for writing, dreaming of traveling the world. To add a bit of last-minute drama to this entry, in between writing it and posting it, I was nominated for an award. This time, it’s one I can comply with. I’ve already exceeded my word limit , but look for my acceptance post in the near future. The rules sound more like a chain letter, so I don’t blame you for ignoring them. But you DO deserve an award for blogging, Dan. Keep the good stuff coming! Thanks Paul. That’s high praise. Great post and congratulations on the award. I really like your acceptance. I’m nominating you for the Blogger Award Acceptance Award. (known as BAAA) You don’t have to do anything. I think something can be done. Thank you Christine. That is a wonderful comment and a great idea. Excellent post Dan. WordPress awards can be time-consuming and that’s one of the reasons why it’s hard to respond to every nomination. My nomination for you is the “I Love Football and Cats” award. All you have to do is root for your team and feed your cat. Pretty simple. I think you can handle it. I accept Mary. But do I have to feed them during football games? I mean, the Steelers are only on about four times a year in New England. Sometimes, I forget to eat. The cats won’t starve in three hours. You’re good. Thanks Lois. I’m going to add a bit of mystery for you. Your blog post today (the attic photo) is featured in my response to the unnamed award. I am planning to post that on Sunday so it won’t be a mystery for long and I think you won’t mind. I don’t mind people who don’t accept awards. I’ll nominate them anyway. I do mind people who act like you’ve burdened them by nominating them. I mean, when people invite me to wretched things, like playing baseball at MIL’s church, I do still say, “Thank you for making me feel included,” or somethin gracious, because you know, they’re being nice. Awards do take a lot of time. But then, that’s another reason to at least say thank you, because that person spent some time just to include you. I think that’s pretty special. I really do appreciate the award nominations. I agree that, at the very least, you can thank the people for the effort (I did). Does the “Thank you for making me feel included,” end with a “but” following that comma, ‘cuz I’d be putting one there. Thank you for nominating me and look for a response on Sunday – You and Lois are tangled up in that post, but in a good way. Well yes, of course you said thank you, because nice manners at the very least. Yes, awards on WP is something I think a lot of us are ambivalent about. They can inadvertently make blogging feel like work. “Do this to accept; do that and pass it on; write this and then that; and while you’re at it, please do THIS too.” So I really like how you’ve handled it here, Dan. This seems like the perfect compromise, as of course you don’t want to just ignore the kind gesture of fellow bloggers. Yours is one of less than five WP blogs that I follow closely enough to get email notifications for. (I NEVER check my reader.) I always enjoy how you write about whatever you feel like. You haven’t limited yourself to a single topic (though there are some pretty great blogs that ARE dedicated to only one thing too!). When I see that there’s a new post from you, my first thought is always, “I wonder what Dan is going to talk about today?” It can really be a lot of fun to learn more about what fellow bloggers like/don’t like. Thank you so much Wendy. That comment is better than any award. I am trying to let this blog take me where it wants to go. By that I mean I’m trying to write about lots of different things but hoping that there’s a common thread. Flat Coke? Really? You’ll always be successful with that common thread, Dan, because you put so much of yourself into each post. YOU are the common thread and I think that’s great! And yes, flat Coke! To answer cardamone5, no, I never was given that when I was sick. I just have never liked the carbonation. To my taste buds, all that fizzing takes away the taste. To this day, if I have a bottle of Coke, I’ll spend 10 minutes shaking it up, letting the fizz out, just to get it flat. And it’s not at all uncommon for me open a Coke on say a Monday, and still be drinking it on Thursday or Friday! Flat Coke? Yuck! Maybe a residual from being sick as a kid? I know what you mean about awards. I accepted two recently because I loved how creative they were, and now I have been nominated for another one, and I think, do people really want to hear from me again this week. Maybe I’ll wait. Just to give people’s eyes a rest. Like you, I am humbled by the nominations, and unsure whom to tap. There are just so many people I respect. How to pick? These are, of course, wonderful problems to have, blessings really, and I think your post did a good job of reflecting that. You’re right about the flat Coke, we were given that or just the syrup when we were sick kids. Right about the awards too. Humbled is a good word. I’m glad you liked this approach. Thanks Elizabeth. I for one hope you share that poem one day. Congrats on the award. You’re so deserving. Your blog continues to have a welcomed feel to it. Thanks Audrey. You never know where this might go. I love poetry but for now I’m enjoying reading it. Congratulations for the award. You truly deserve it. If you’re not much into award thing, you always know that you inspire me in many different ways and push me to write something new and refreshing. During my school days, I was a very award-hungry kid. I was aggressive and cruel and would fight for every certificate and trophy that I can get my hands on and for that I was my principal’s favorite. Now, I don’t think much of awards, but the fact that you appreciate my work and even shared it on your blog is nothing less than an award. You, Cheryl, Peter Nena, Damyanti and others have allowed me to explore themes and ideas that I never thought of. Lots of love and hugs to you for inspiring me. Keep up the good work. Thanks Sharukh. I have learned do much from reading your blogs and the writing of the others you mention. Being part of that group has been an honor for me. I nominate you for the ‘He Infiltrated My Draft Vault’ because you write my posts better than I ever could. Seriously this was a great post, Dan, and very meaningful, gracious way to pay tribute to the bloggers who inspire you. It’s most definitely a two-way street ! You need to know that you are in that list of inspiring writers Sammy (and not just for the ideas I seem to steal). There are plenty of ideas that I’ve missed, but I enjoyed your take on them. Thanks! Dan, I so look forward to our weekly visits ! “Antarctica needs more bloggers” – very true, but this Canadian ain’t movin’! I love how you managed to graciously attend to the nomination at the same time, sidestep the whole shebang. I’m taking notes. See, this is why I called out Canada specifically – you’re the best. Dan, YOU inspire me just by the way you think, the way you write, and for who you are. I am officially an “award free blog” because I just don’t have the time to put time into these awards. That does not mean I really am touched when someone nominates me, because I really am. I have a page for all the awards I have been given, and a list of them with a link to the person’s blog who nominated me. Now for the biggest reason YOU inspire me. A while ago you wrote that you do not use the WP editor for yours posts. That stuck with me. Two days ago when I went to my Homepage at Petals. 11 of my posts were completely gone, 9 of those being my Niagara Falls posts, which represents at least 50 hours of work on my end. I just about had heart failure. No joke. I flew into a panic, my heart pounding so hard, me sweating and shaking, as the knowledge of what was happening sunk in. I immediately went to my administrator’s page, and began to look IF I could find those posts. I did. IN THE TRASH. With shaking hands, and one very shaky finger, I restored all 11 posts. Hindsight I should have stopped right there and used my laptop because one little error on my part with that shaking finger, I would have permanently deleted my posts. By the way. If you use Word, set up your blog by using the New -> Blog Post template and entering your WordPress information. Word will connect to your blog and read the settings. Once you have that set up, open Word, proceed to create New – Blog Post. Make sure you have your account selected. You can open some of your recent posts simply by choosing the “Open Existing” option (BE SURE NOT TO HIT PUBLISH AFTER DOING THIS) – and save the post on a local drive. this preserves the HTML format of the blog post but not the look and feel. You can also just create a new blank post. Copy the title from your blog entry and paste it into the title area in Word. Then, copy the rest of the post, images included and past that into Word using either the “Keep Source Format” or “Merge Format” options. This will preserve the look and feel of your post. Well deserved ! Great post . so glad you shared I like them too! Another great post, Dan. You certainly know how to write and I am sure that all your blogging followers learn a lot from you. Accepting awards can be a lot of work and as a result I shy away from them. Your tribute here to bloggers is a fabulous award to all. Thank you! Thanks Elaine. I like the idea of awards but when you have to nominate 10-15 others, I grow weary. I tried, but I wanted to see if the people I was nominating had already been nominated or ran award-free and that takes a lot of time. Then I was caught in “is this person more inspiring that that person?” I follow so many blogs, the math just wasn’t working. Dan, congratulations for the award and for the nominations. I always love that ouroboros symbol. For me it’s a picture of life itself. Self-regeneration, self-destruction, and all the other endless inevitable circles. Thanks Peter. I thought that you wold like that symbol.